"The iPhone 6 employs 1GB of Mobile DDR3 by comparison while 3GB of DDR3 DRAM has been a predominant configuration in several flagship Android phones in the last year." ENGLEWOOD, Colo.--(BUSINESS WIRE)--The recently released Samsung Galaxy S6 Edge is the most expensive Galaxy S line smartphone yet built, but has a lower retail price than a comparable iPhone 6 Plus, according to a preliminary estimate by IHS (NYSE: IHS) and its Technology Mobile Handsets Intelligence Service. The Samsung Galaxy S6 Edge smartphone with 64GB of NAND memory carries a bill of materials (BOM) of $284.85 with the cost rising to $290.45 when the $5.60 manufacturing cost is added, according to results from the IHS teardown of a phone purchased from Verizon. 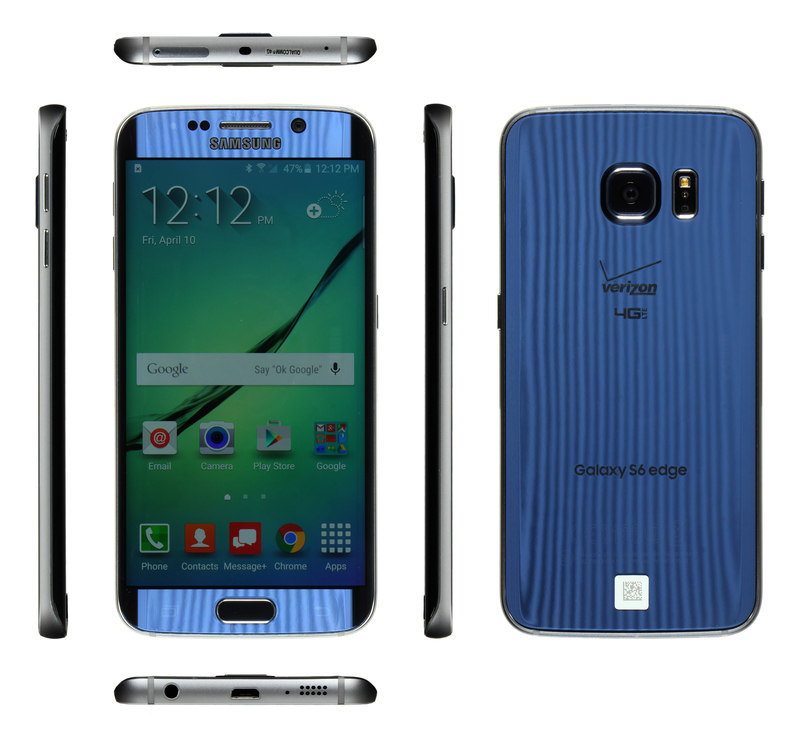 The retail price at Verizon for the Galaxy S6 Edge is $799.99. A comparable Apple iPhone 6 Plus 64GB has a BOM of $236.04, which rises to $240.05 after the $4.01 manufacturing cost is added, and a retail price from the Apple online store of $849.00, $50 higher than the S6 Edge. “Overall, this is the priciest Samsung Galaxy S series bill of materials to date. In fact, Samsung seems to have consistently packed more features and cost into their flagship Galaxy S line of phones over the last three generations of product, now producing a BOM cost that is notably higher than comparable iPhones,” said Andrew Rassweiler, senior director of research and analysis for IHS. Source: IHS Technology iPhone 6 Plus analysis December 2014. S6 analysis April 2015. Display / Touchscreen Module, 5.1"
Samsung has been using the Galaxy line to showcase its Super AMOLED technology in previous Galaxy S series generations, and the Galaxy S6 and S6 EDGE are no exceptions to this rule. The displays on the Galaxy S6 and S6 Edge offer higher resolution (2560x1440 pixels, known as Quad HD) than the iPhone 6 Plus which features 1920x1080 (1080p) resolution. The IHS teardown also showed that the unique Edge curved display screen costs $85, about $24 more than the display for the regular version of the S6. Furthermore, when compared with the iPhone 6 Plus, the display on the Galaxy S6 Edge is more than double the cost of the TFT/IPS display and touchscreen on the iPhone 6 Plus, which IHS estimated at $41 in November 2014. 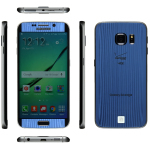 The S6 Edge features predominantly Samsung silicon, but there are several variations of the Galaxy S6 and S6 Edge that also feature Samsung modem chips rather than those from Qualcomm found in the Verizon sample torn down by IHS. “There are other versions of the S6 sold by different carriers in different markets that do not use the Qualcomm chip set. We have procured another model so we can compare the models and look at the cost differences,” Rassweiler said. The apps processor in the Edge torn down by IHS is a Samsung Octa-Core, 64-Bit, built in 14nm, and is one of the first (but not only) 14nm processors the IHS team has seen, with a cost of $29.50. The baseband integrated circuit (IC) is a Qualcomm MDM9653M multi-mode baseband processor, which has an estimated cost of $15. The NAND memory is a Samsung (KLUCG8G1BD), 64GB UFS NAND, PoP, and the DRAM is a Samsung (K3RG3G30MM-DGCH), 3GB LPDDR4, PoP. “This is the first time we have seen NAND Flash memory in package-on-package (PoP) format. In this case the flash memory is mounted directly on top of the Qualcomm MDM9653M processor. That’s usually something we have only seen when DRAM memory is placed on top of the applications processor,” Rassweiler said. “‘PoP packaging is used to reduce the overall footprint, and in this case is being used in more than one place in the design. 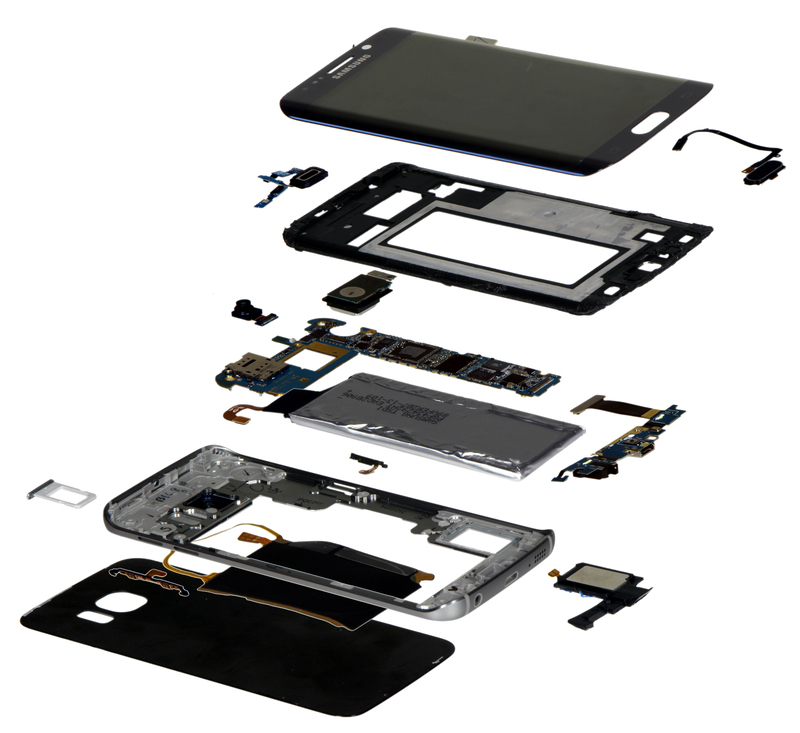 For more information about the IHS teardown of the Galaxy S6 Edge smartphone, visit https://technology.ihs.com/ResearchAreas/450461/teardowns.